6. $12 million for Energizing Insular Communities to cut energy costs, as required by Public Law 113-235. I also led a letter, co-signed by 96 House colleagues, requesting continuation of $22 million in funding for the Gulf War Illness Research Program. Appropriators now compile tens of thousands of requests and begin drafting the 12 separate spending bills for FY20, which begins October 1. On Thursday, the House passed H.R. 1585, the Violence Against Women Reauthorization Act of 2019. I cosponsored the bill, which preserves critical features of current law and increases protections, programs, and services for victims of domestic violence, sexual assault, dating violence and stalking. VAWA 2019 also enhances judicial and law enforcement tools to combat the problem, including directing grant fund to ensure the lawful recovery and storage of dangerous weapons by law enforcement agencies. U.S. Virgin Islands Delegate Stacey Plaskett added language during floor debate that doubles funding for the Sexual Assault Service Program and the Transitional Housing Assistance Program for all the territories. 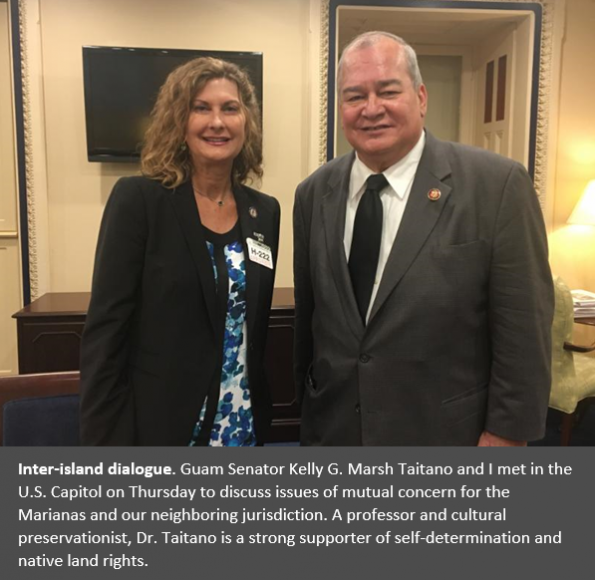 The last reauthorization in 2013 included my language that doubled Sexual Assault Services Program funding for the Marianas. 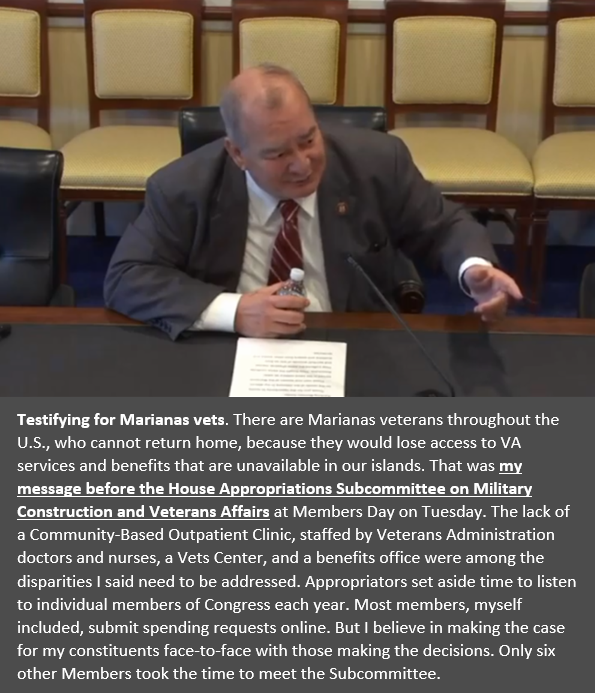 Senate Democratic Leader Chuck Schumer of New York and Appropriations Committee Ranking Member Patrick Leahy (D-Vermont) offered yet another version of disaster relief on Tuesday and continued to insist on keeping Marianas Medicaid money in any bill the Senate passes. I upped the Medicaid funding to $36 million during floor debate in the House. A vote to end debate on the House-passed bill, H.R. 268, was defeated on Monday. 46 Democrats voted to move the much-needed disaster spending bill; 48 Republicans voted not to. Meanwhile, according to both Governor Torres and the Centers for Medicare and Medicaid Services, Marianas Medicaid is now out of money, leaving over 15,000 of our people without health insurance. Just in time for 2020 CW permit applications, the U.S. Department of Labor published rules for getting a temporary labor certification on Monday. 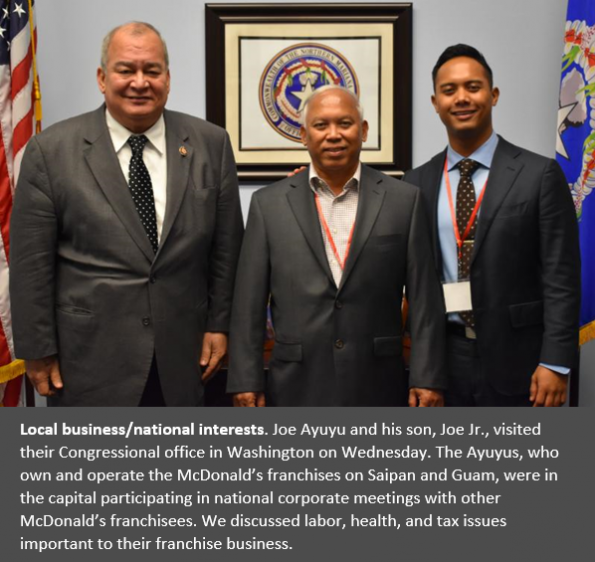 The certification—that no U.S. worker is available for a given job—is a requirement of last year’s Northern Mariana Islands U.S. Workforce Act, PL 115-218. The application period for fiscal year 2020 Commonwealth-only Transitional Worker (CW) permits opened on Thursday; and applications without a temporary labor certification will be rejected. The Department has produced web-based training for employers on how to get a certification. A public comment period on the TLC rules is also open now through May 31, 2019. 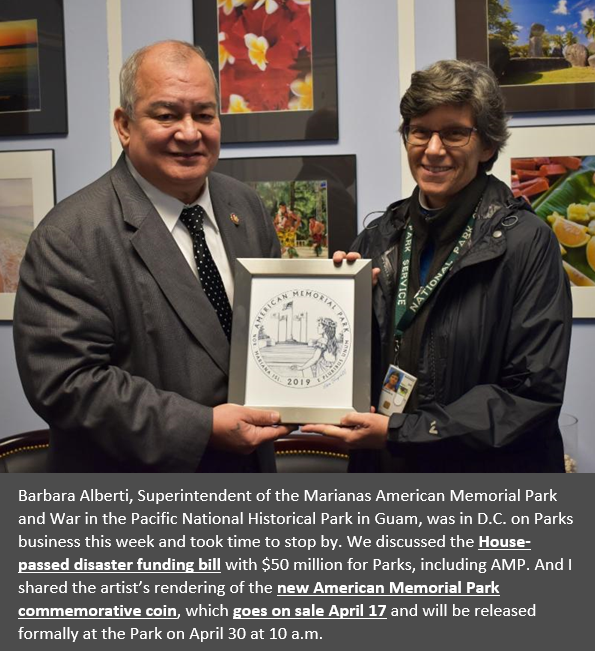 The Marianas is receiving $1.2 million for sportfish restoration projects and another $1.1 million for wildlife and habitat restoration, the U.S. Department of Interior announced this week. Congress authorized the grants in Dingell-Johnson Sport Fish Restoration Act and the Pittman-Robertson Wildlife Restoration Act. While we welcome the support, my legislation, H.R. 1809, would increase that amount to approximately $8 million each year by providing the territories funding parity with the states. This money comes from excise taxes paid everywhere in the U.S. on firearms and ammunition, sport fishing gear, boat engines and fuel. In addition to protecting wildlife and habitat, the money can be used for projects that benefit public use, such as boat access development and maintenance, and for land acquisition. I believe we hold our islands in trust and have a moral responsibility to leave them in better shape than when we were given stewardship. These federal grants help us meet that responsibility. But caring for, restoring, improving the lands and waters of the Marianas is not only for the future. We all benefit today from having a healthy environment. 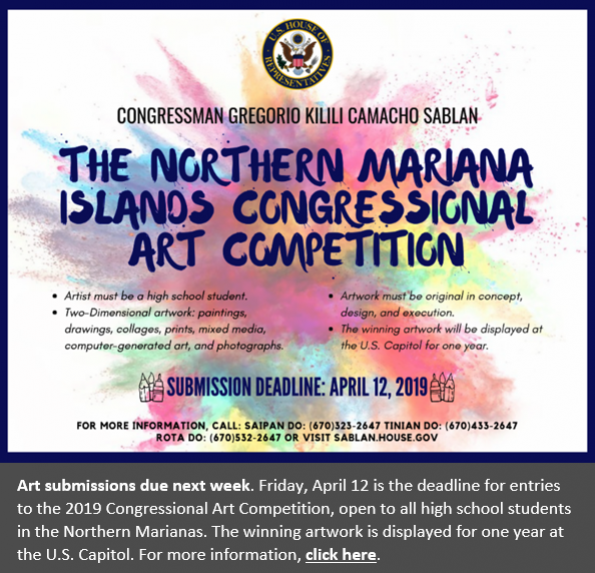 To bring about 180 high school students from the Northern Marianas and other territories and the Freely Associated States to Washington and other historic cities, the Close Up Insular Areas Program was provided $1 million, the Office of Insular Affairs announced on Thursday. A portion of the funds will also help pay for 320 students and teachers to participate in annual educational summits held in the islands and organized by Close Up. 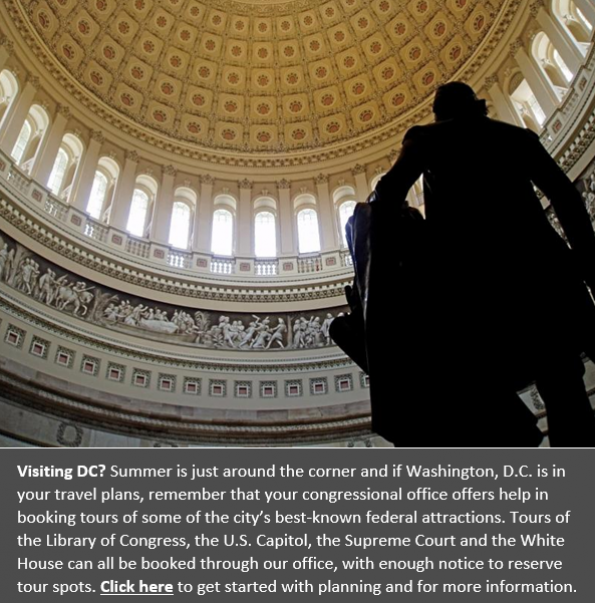 For over 30 years, Congress has provided funds to give over 10,000 island students an opportunity to travel to our nation’s capital for civic education programs. 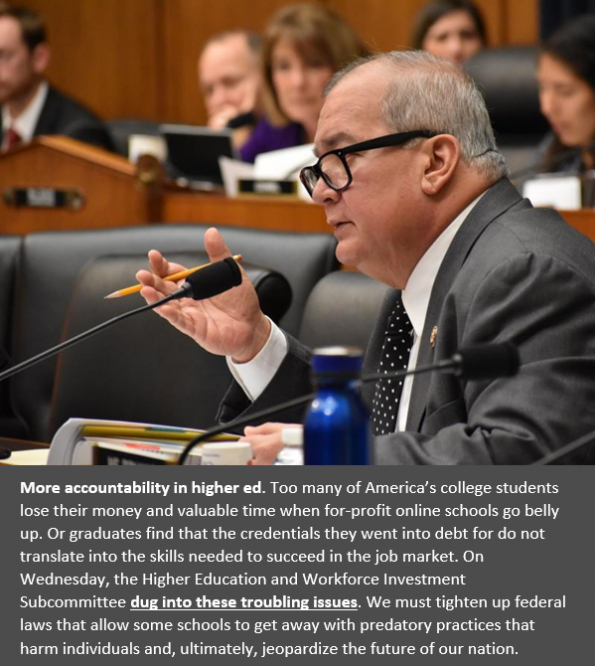 I have long supported the Close Up program and the opportunities it provides our youth to learn about their government and become educated citizens. 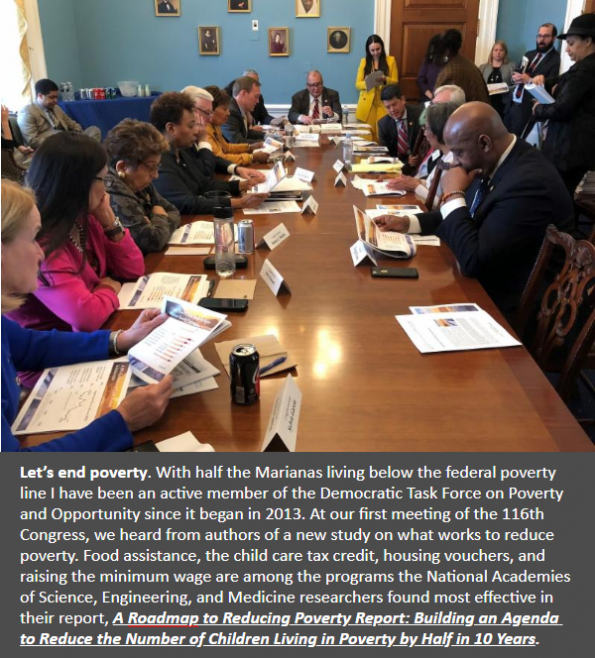 Just last month, I joined my insular area colleagues in writing to the Office of Insular Affairs in support of continued funding for the Close Up Program. 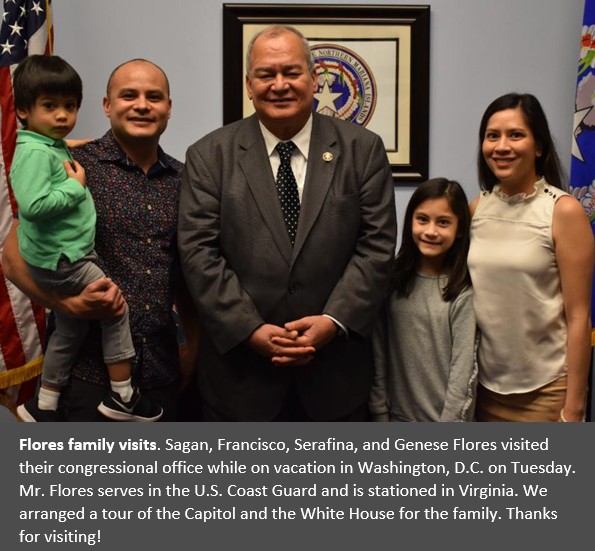 I also asked for increased funding for OIA’s Technical Assistance Program, where funds are drawn for Close Up support, in my FY2020 appropriations requests despite the administration’s repeated attempts to cut the program. Congratulations to the International Economic Development Council (IEDC) for successfully applying for a $353,000 Economic Adjustment Assistance grant to support the implementation of an economic resilience initiative for the Marianas. The U.S. Economic Development Administration (EDA) announced this week funding to 10 states, the District of Columbia and the Marianas for Economic Adjustment Assistance projects to help communities design and implement strategies to adjust or bring about change to their economy in response to structural damage to their underlying economic base. According to the EDA, the IEDC initiative includes the delivery of technical assistance on infrastructure redevelopment, assessment and analysis of the regional business environment, and delivery of economic resilience and recovery training. By rebuilding infrastructure, the Marianas can become more resilient to the effects of future natural disasters, which will lead to long-term economic stability for our islands. H.Con.Res. 30 – Recognizing the significance of equal pay and the disparity between wages paid to men and women.